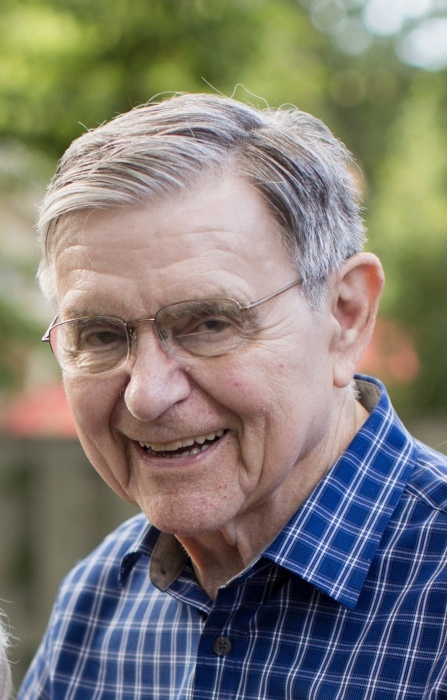 Edward W. Schauerte, 84, of Peoria died at 10:52 p.m. on Sunday, March 17, 2019, at Northwestern Memorial Hospital in Chicago. Ed was born on April 10, 1934, to Edward and Clara (Martell) Schauerte at St. Francis Hospital in Peoria. He graduated from Murphysboro High School, attended Southern Illinois University, and received his medical degree from the University of Illinois College of Medicine. He married Eugenia Sparrow on January 14, 1961. Eugenia, or Genie, who cared lovingly and patiently for Ed during a number of illnesses in his later years, survives. Also surviving are one sister, Alma Hamilton of Avon Lake, Ohio; one daughter, Beth (Phil) Clifton of Queenstown, New Zealand; sons Mike (Yuko) Schauerte of Miyazaki, Japan and Mark (Christine) Schauerte of Park Ridge, IL; three grandchildren, Emma (Mike), Mia (Mike), and Eddie (Mark); one niece, Jeanne Devor of Avon Lake, Ohio; two nephews, Jim Hamilton of Lawrenceville, Georgia and Dan Hamilton of Sandy Springs, Georgia; twelve grandnieces and grandnephews, and five great-grandnieces and great-grandnephews. Ed grew up in Peoria, Bloomington, and Murphysboro. As a student at Southern Illinois University in Carbondale, he was known to frequent the local pool hall (to the dismay of his mother). While shooting pool one day, one of Ed’s pals asked him what he planned on doing after college, noting that Ed was an excellent math and chemistry student. The lack of a ready-made answer prompted the friend to suggest applying to medical school. Ed did, was accepted, and left college after his junior year to enroll at the University of Illinois College of Medicine in Chicago. On a blind date in Chicago, Ed met Genie, a second-grade teacher in Evanston who grew up in Georgia and had moved to Chicago after graduating from Michigan State University. Their courtship included attending hockey games at the Chicago Stadium to watch the Chicago Blackhawks and led to their wedding on January 14, 1961 in Atlanta, Georgia. Soon after their wedding, the newlyweds embarked on the first of what would become a litany of international adventures together. Ed served as a captain in the U.S. Air Force and base surgeon at the U.S. Air Force base in Giebelstadt, Germany. Ed and Genie would take weekend trips throughout Europe, cementing a love of travel that would include trips to nearly every continent of the world. Ed and Genie’s love of travel was inherited by their children, leading to Beth marrying Phil and moving to New Zealand, Mike marrying Yuko and moving to Japan, and Mark and his wife, Christine, spending a year abroad in New Zealand. Mike’s love of travel also included an aptitude for languages, including Japanese, French, and Spanish. After being discharged from the U.S. Air Force, Ed completed his medical residency in Omaha, Nebraska. The couple eventually settled in Peoria, Illinois where Ed practiced medicine as a radiologist and they raised their three children. In addition to a love of world travel, Ed became passionate about world sports over the course of his life, including rugby, cricket, and bullfighting. In the 1970s, Ed was one of few Americans to follow international soccer. He combined his love of travel and soccer to journey with Mike to London, England to watch the 1978 World Cup (ostensibly because the games were not televised in the United States). Four years later, the 1982 World Cup was held in Italy. Instead of another trip, Ed purchased a satellite dish that allowed him to watch the World Cup games, and other international soccer matches over the years, in the comfort of his own home. His love of soccer rubbed off on his children with Beth being a trailblazer as one of two young women to play on the men’s soccer team in high school because no girls soccer team existed. Family vacations often combined soccer and travel, with many visits to Chicago to watch the Chicago Sting (of the now defunct North American Soccer League) play at Wrigley Field or old Comiskey Park. In 1981, the family even drove from Peoria to Toronto, Canada to see the Chicago Sting beat the New York Cosmos to win the NASL championship. Ed researched thoroughly nearly anything he did. Family vacations required multiple trips to the AAA store in Peoria to gather maps and travel guides. He would underline key passages in the travel guides and put together a detailed itinerary that focused less on relaxation and more on seeing every four-star rated site. Other family driving trips included many visits to Buffalo, New York or Cleveland, Ohio to see Ed’s sister, Alma, her husband, Joe, and their three children. Ed emphasized all aspects of education to his children, including the fine arts. Nearly every visit to Chicago or family trip included stops at museums and art galleries, perhaps laying the groundwork for the art history major pursued by Beth, and her love of art and design. Saturdays in the Schauerte household meant one thing: Notre Dame football. Ed was a passionate fan of the Fighting Irish and spent halftimes and postgames rehashing the games with Mark. Lamenting about Notre Dame kickers or criticizing coaching decisions were mixed in with celebrating victories over a bourbon on the rocks. Ed’s health over recent years had declined, and his world travels stopped. He spent his last days at Northwestern Memorial Hospital in Chicago where he was surrounded by family. Soon before his death, his family toasted him with some cheap bourbon, giving him one last nip of a drink that he enjoyed and said was important to be strong enough to “declare itself” as it went down your throat. Ed was a very loving husband, father and grandfather (or Pawpaw). He loved his family with all of his being and was generous and considerate to his core. He was constantly thinking of others (sometimes too much) and will be missed dearly. His family and friends mourn him because our lives won't be the same without him.